Taking the weight off my shoulders…i mean plate. There are literally millions of blogs out there about food and books and movies and music… and yes.. weight loss. It can be incredibly overwhelming. So how the hell do I stand out from all those other voices? I am the girl with the pretty face and the big body. I’m the fat girl. I’m the girl that would “be even prettier if she just lost weight”. I’m the girl who stumbles through life, struggling daily with my self image. I just try to get through every day with my self esteem intact. I’m the mom of two who just couldn’t get rid of the baby weight. I am the 5 year old girl, who went through childhood never having been refused a second portion of the quickest, easiest, and most fattening foods. Thankfully, I am also someone who is loved. People want to help me as I try to get healthier. If this sounds familiar, please keep reading. I made the decision to have a gastric bypass surgery May of 2015. If you’re unfamiliar with the term, a gastric bypass surgery is a procedure where a doctor surgically makes the patient’s stomach smaller. This makes it difficult to eat a lot of food in one sitting, thus resulting in rapid weight loss for the patient. I intend to post a separate blog that goes into more detail. My heaviest weight was 369. My current weight is 199. This means in almost two years I have lost over 170 pounds…and I’m still losing. The honeymoon stage of the weight loss is now over. Now I need to stay on track, feeding my new stomach the proper foods. At my lowest I weighed 189 pounds, but just like most people, I had a hard time staying there. I put on 10 pounds over the course of 6 months. Despite my attempts to stay positive, I see it when I look in the mirror. This is part of the reason that I decided to start a blog. I’m doing this to help my readers by sharing my experience, giving tips where I can, and sharing fun and healthy recipes…. but it’s mainly to help keep myself honest. 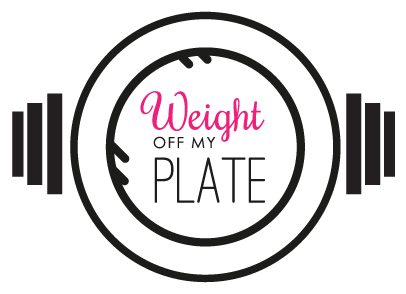 I’m hoping that the double metaphor of “weight off my plate” will take the “weight off my shoulders” and make this process easier in the long run. Even though I’ve lost over 170 pounds, the fat girl inside will always be hungry for the next meal. I’m hoping this process will act as a catharsis, helping me find the tools to feed my head instead of my belly. Less chewing that way. Two years after the surgery, it’s up to me now. It’s my responsibility to make the right choices, both dietary and lifestyle. The surgery gave me the help I needed to get my life under control. Before the surgery, I wasn’t sure how much time I would have with my children. Now that I have my life back, the choices I make now are what will determine how much time I will have to enjoy my grandchildren. Follow me and share all you want…it humbles me tremendously that you’ve read this far. You will help me lift the weight off my plate…forever.